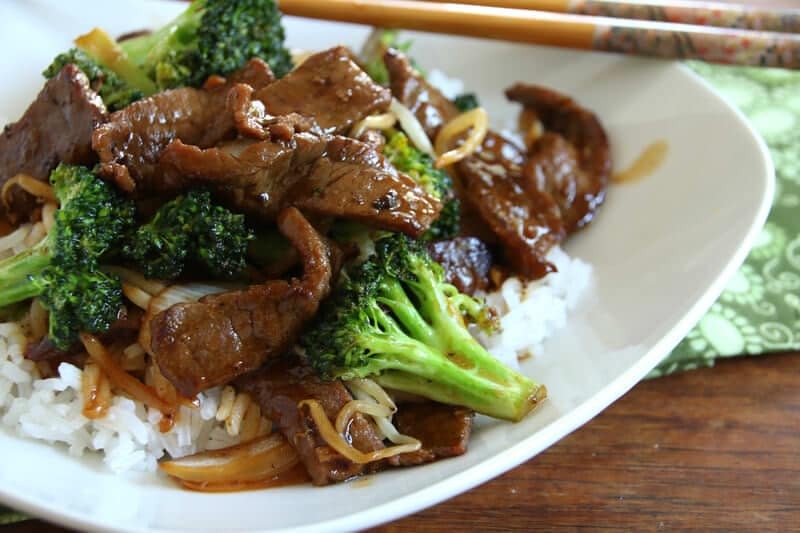 This delicious Chinese Beef and Broccoli comes together in just minutes. Perfect for busy weeknights and WAY better than Chinese takeout, this is sure to become a favorite in your home! One of the things I love about Chinese food – aside from the fact that it tastes so darn delicious – is how quick it is to make. Once you have the prep work of all the chopping done – and that can conveniently be done in advance – it literally takes 5 minutes or less to actually cook. Another thing I love about Chinese food is that it’s such a great way to get in those healthy veggies. Stir-fries are perfect for using up veggies you have on hand – onions, bell peppers, carrots, celery, zucchini, broccoli, snow peas, etc. Just throw ’em all in, give ’em a fry, stir in the sauce, and voila! 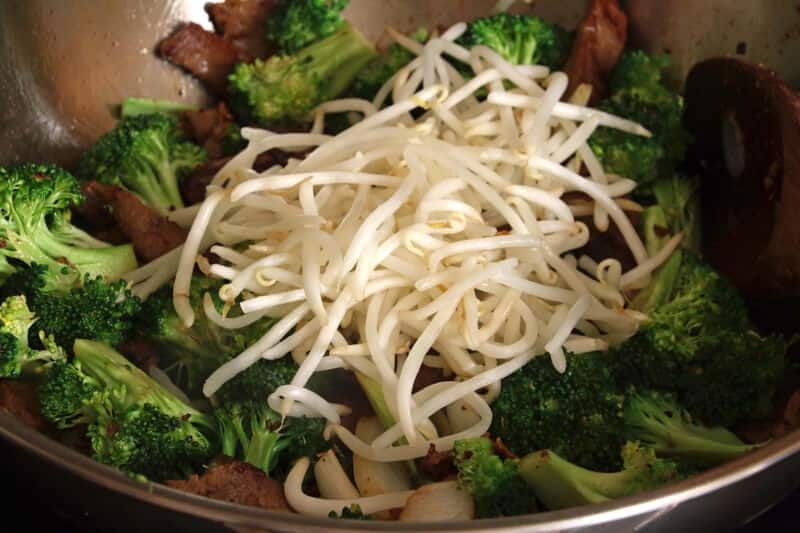 Chop up the veggies, slice the beef, mince the garlic and ginger, and wash the bean sprouts. Toss the beef in the soy sauce and sherry. All of this can be done well in advance to save you time come dinner. Heat the oil over high heat in a wok or large heavy skillet. 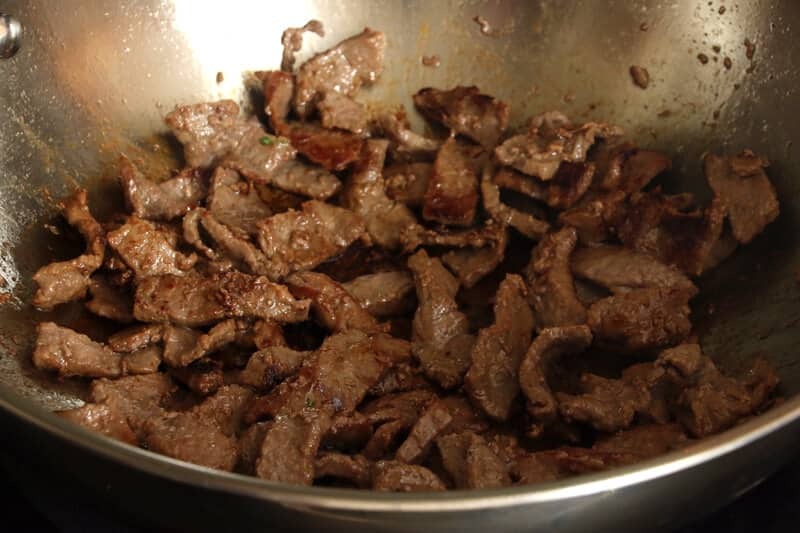 Once very hot, add the beef and fry until lightly browned, about 2 minutes. Add the onions, garlic and ginger and fry for another minute. Add the broccoli and fry for another minute. Stir in the bean sprouts. Stir in the sauce and simmer for one minute. Serve over steamed rice. Enjoy! 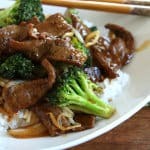 LOOKING FOR MORE GREAT CHINESE RECIPES? 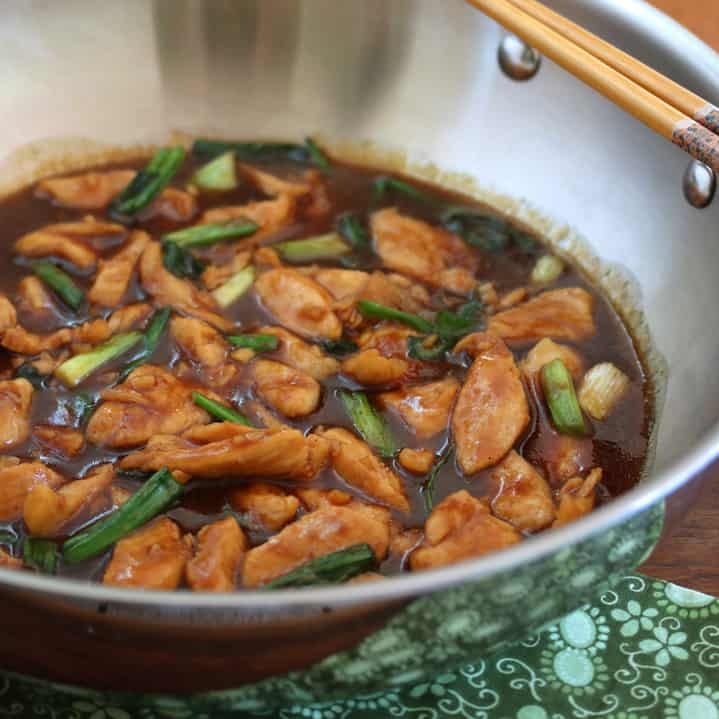 DON’T FORGET TO TRY OUR MONGOLIAN CHICKEN! 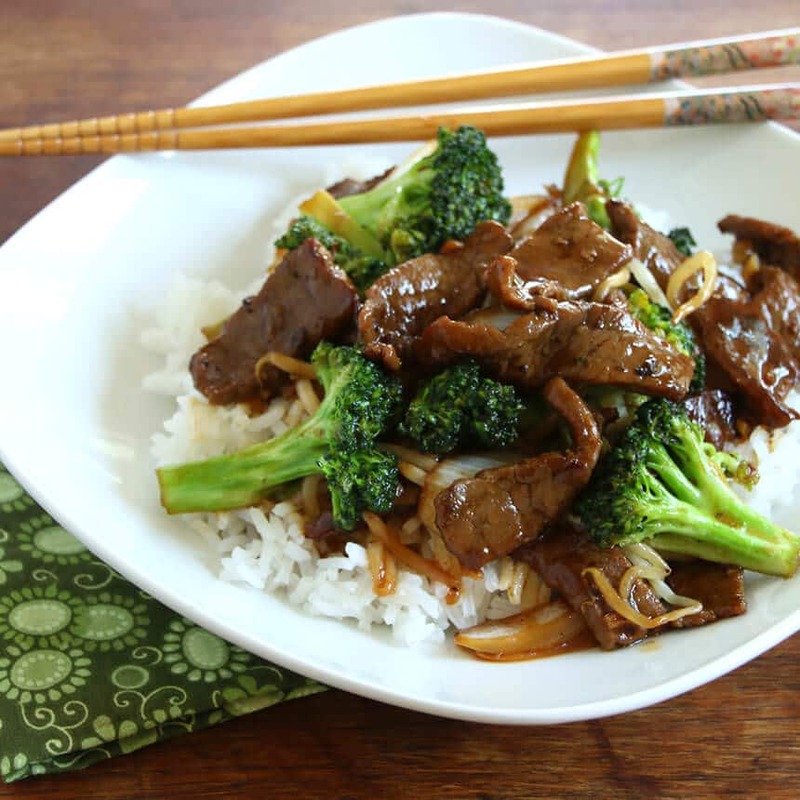 This Chinese Beef & Broccoli rivals your favorite Chinese restaurant or takeout! 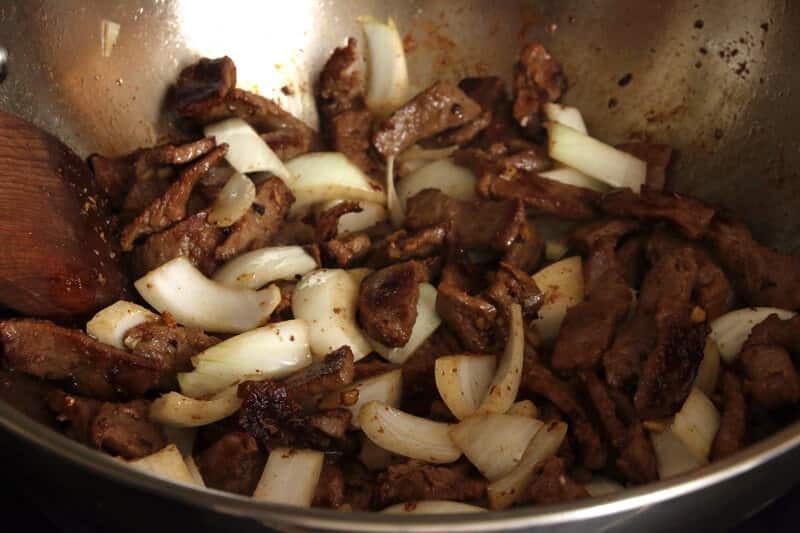 Toss the beef strips with the soy sauce and sherry. Set aside until ready to use. Combine the sauce ingredients until the cornstarch is dissolved. Set aside until ready to use. Heat the oil over high heat in a wok or large heavy skillet. Once very hot, add the beef and fry until lightly browned, about 2 minutes. Add the onions, garlic and ginger and fry for another minute. Add a little more oil if necessary. Add the broccoli and fry for another minute or until crisp-tender. Stir in the bean sprouts. Stir in the sauce and simmer for another minute. *The quick cooking times assume you're using a wok or heavy skillet over very high heat (some cooktops don't have the capacity to go as high as high-heat wok cooking requires). You may need to increase the cooking time accordingly. Oh yummmmmm!! This looks so delish, can’t wait to try it, thanks! I want to dive into that plate headfirst! :) This looks fantastic, Kimberly, I’m going to make it tonight!! The best way to eat broccoli! The ingredients are amazing and I bet this taste great. Especially with the lovely broccoli. This does seem very quick and delicious! A super idea for a weeknight meal instead of ordering in! I love stir-fries! Healthy and quick! I love this! I honesty cannot believe I have not made this, must make now! Wow! So much better than take-out! This is perfect for busy nights…but, fancy enough for guests too! Such a classic dish – one of my favorites from when I was a kid! This was soooooo yummy! Made it for dinner this evening and it was a huge hit – not a bite left! So good! Thank for another tasty and quick meal. Absolutely delicious! Your biggest fan in Bermuda. Thank you, Kimberley…I have taken your advice and signed up….very much looking forward to your next Bermuda posting. Your tour of St. George’s and your stay at the Hamilton Princess were amazing. I loved the photos and your wonderful write ups.. I could tell that you and your husband were really enjoying yourselves…who wouldn’t want to visit our beautiful Island after seeing these postings. Bet you can’t wait to bring your children! Wonderful, Carron, thank you! We can’t wait to return with our whole family to your magical island. What made our visit so special was not only the breathtaking sites and scenery but the many wonderful people we had the privilege of meeting and visiting with (Dr. Edward Harris, Carol Holding, Angelo Armano and Edmund Smith from Ascots, Art and his wife from Art Mel’s, and we even bumped into a couple there who literally lived just 5 minutes from us several years ago). Those personal connections made our trip so meaningful and added to our list of cherished memories. This looks like restaurant quality! And that’ll be perfect for my husband, since it seems this is the #1 thing he orders at Chinese restaurants. Can’t wait to try it and see how it compares! 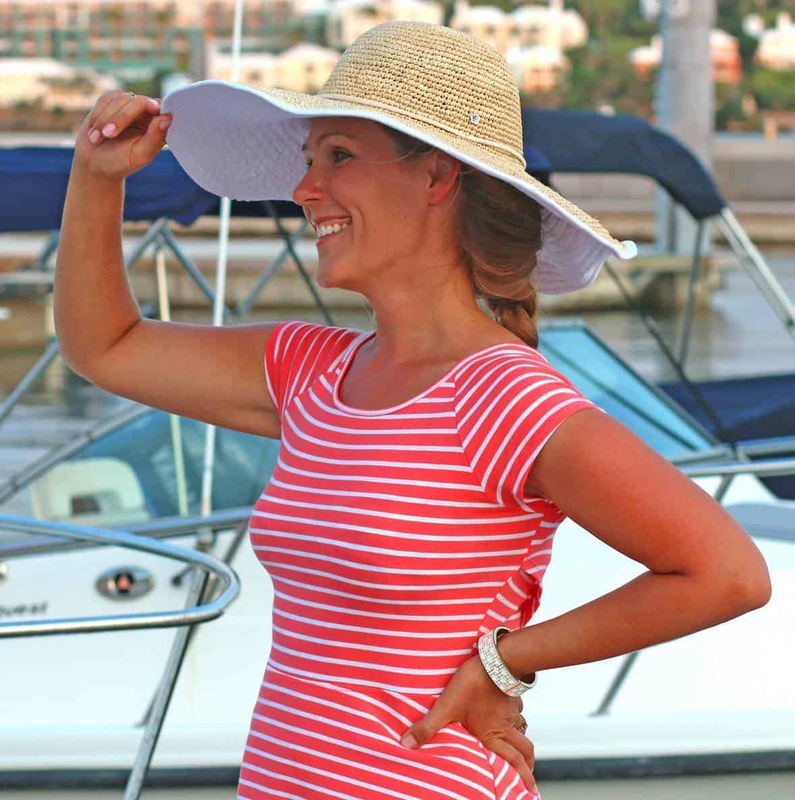 It’s one of my favorites, too, Chrisy, and I’m confident you’re husband will love this! What’s Sherry?… Is it a wine or oil? 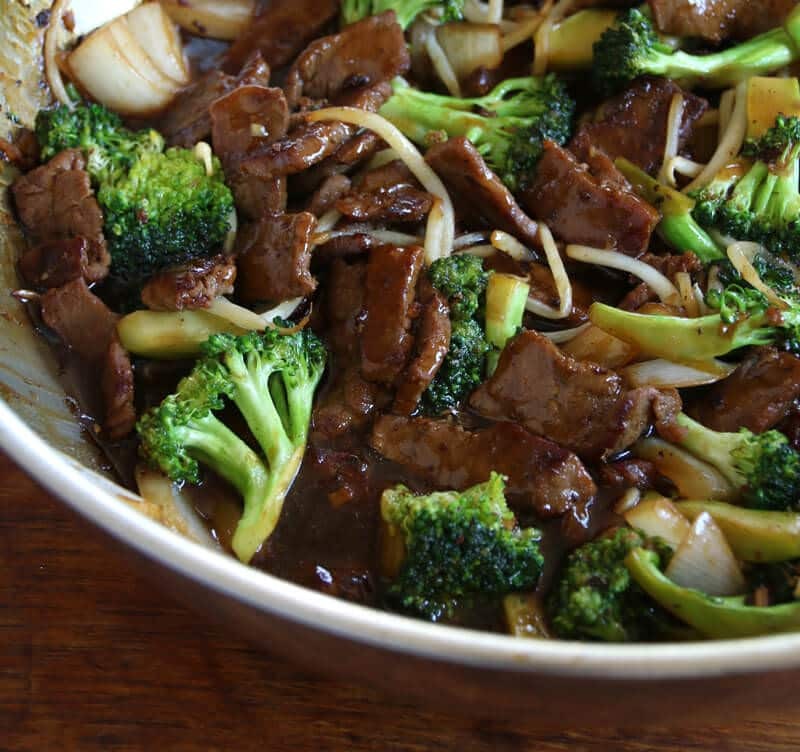 Can’t go wrong with Beef and Broccoli, this sounds wonderful, my family would love it! For sure, Joy, even our 3 and 5 year olds love it! I am loving the saucy deliciousness of this!! Can’t wait to try it soon! Thanks, Lauren, it’s so quick and easy to make – we love it! Homemade is the best, Sharon! Not only does it taste as good as the very best takeout, it’s healthier and you know what’s in it! Looks so delicious. Stir-frying is an under-utilized technique. Bravo for showcasing it! It’s so true, Asian food is the best when you need a quick meal! This looks perfect! Stir-fries definitely are perfect for quick meals, Karen! Thanks! I totally agree with you that stir fry recipes are such a great way to jam-cram lots of veggies into dinner! Love that! And I love the flavors in this recipe, and how wonderfully quick and easy it is! Who needs take-out when you can have THIS!?!? Pinned! Thanks so much for pinning, Shelley! I know, I love how you’re able to eat so many veggies per serving in these stir-fries! I really have to try this! Looks so delish! Yummy!! Prep is everything in Chinese food. This looks wonderful! Great recipe! It sure is, Renee! Getting everything prepped in advance makes everything go lightning speed at the point of cooking! I am throwing away all my take out menus because you just recreated my husbands favorite dish! That glaze…amazing! Haha, Meg! You should make this without him knowing, then serve pretending it’s takeout and see what he says. I’ll bet he says, “Wow, which takeout did you order from this time? This is the best!” ;) Seriously, it’s better than any takeout version I’ve had! Stir-fries are some of my favorite go-to weeknight dinners (and one of the first things I learned to cook). This version looks so good! That makes sense, they’re super easy to make and so a good place to start for a beginning cook! 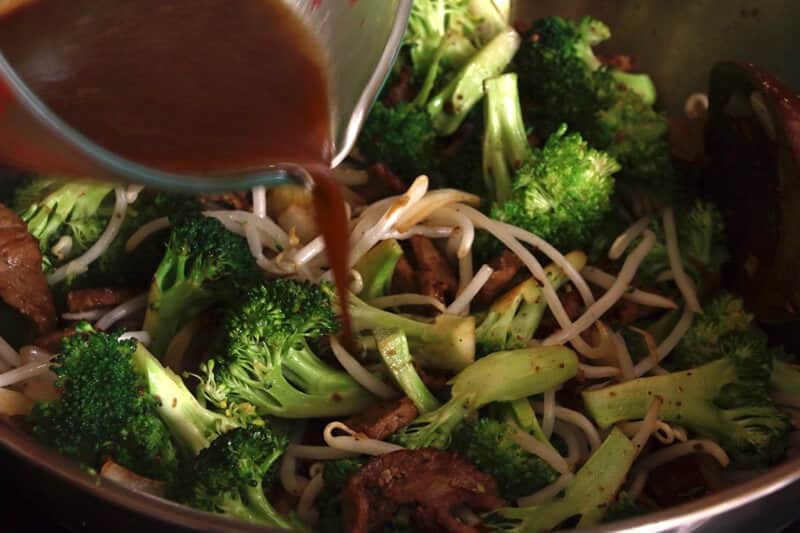 Making Chinese food at home is one of my favorite meals to make! I must try this one! I love making Chinese, too, Jaren! It’s one of my favorite cuisines! I just recently found this recipe, I have very picky daughters and it’s often heard to feed them and the rest of my family the same meal. I can honestly say that this is THE MEAL! My whole family loved this dish and its often hard to feed seven people and make them all happy at once but this one definitely did it. That’s awesome, I’m so happy to hear that, Monshinique! It’s one of our family’s favorites, too, and an almost guaranteed way to get our kids to eat their veggies :) Thanks so much! Can you make this without sesame seed oil? Will it still be good? Toasted sesame oil is what gives a lot of Chinese food its characteristic flavor. Sure, it will still taste good but it won’t taste “as” good and will be missing that distinctive Chinese flavor. For 12 people would I just triple everything? Do you have the nutritional value per serving on this dish? Hi Ashley, I don’t but there are a number of free sites online that let you enter the ingredients and quantities and then give you the complete nutritional breakdown of the dish (eg., fitday and caloriecount). This was not only delicious, but quick and easy! I added thinly sliced carrots and used barley instead of rice! Yummy! Wonderful, Jackie, thank you! Barley is a terrific substitute for rice! I made it exactly as the recipe states it taste just like chinese béef and broccoli with added grenn peppers!! It turned out better than I thought my family love it I trippled the recipe!! Wonderful, Sheron, thanks so much! Wonderful, Theresa, I’m so glad it’s been a hit, thank you! This is not real Chinese food. 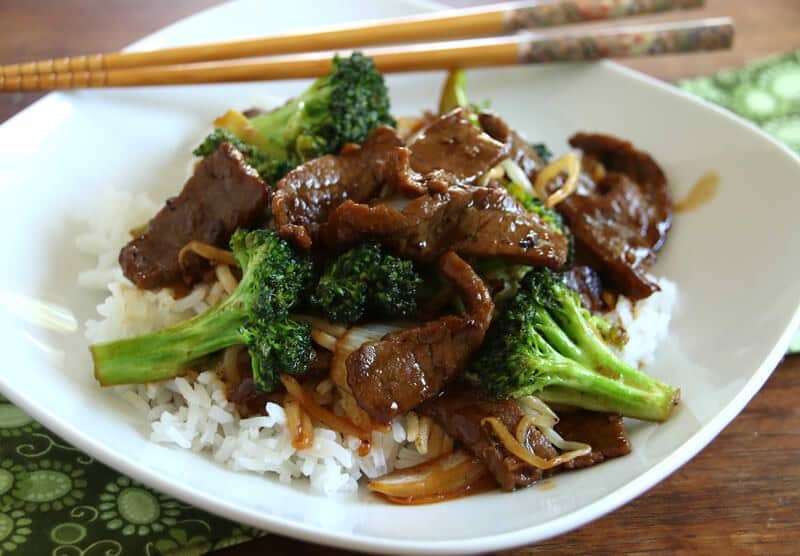 Chinese people do not eat broccoli as it is not native to China. No restaurant in China would serve this stuff. First of all, there’s no reference to “real Chinese food” in my post nor is there any mention of authenticity as it relates to mainland China. Most of the popular Chinese dishes eaten in the U.S. aren’t from mainland China but were created by Chinese immigrants. This is an example of Chinese-American food at its best! Thanks for the recipe. I included 1/4cup of oyster sauce, used beef broth instead of water, 2tbs of chili paste to balance the sweetness and 1tbs of worchestire sauce. I had to reduce the sugar and started with 1tbs at a time until I got it just right. Flat iron steak worked out great and I used peanut oil for the stir fry. Thanks for a wonderful recipe. Huge hit! Made this for dinner tonight – easy, quick and the whole family loved it. I’m thrilled to hear that, Tim, thank you! Absolutely A++. Quick to make and the flavor was better than anything I’ve had in a restaurant or takeout. Very Good!!! My whole family loved it! Note: Omitted bean sprouts, and used Chinese Rice Wine in place of Sherry. Fantastic, so glad you enjoyed it, thank you! This recipe is fantastic! My husband and 3 picky boys all loved it and asked for seconds! Good thing I doubled the recipe. Awesome, Sara, I’m so glad it was a hit, thank you! I’m so glad it was a hit, Antony, thank you! Great, Charles, let us know what you think once you’ve tried it! Wonderful, Charles, I’m happy to hear that – thank you! I made this dish for the first time and my family love it. I don’t like Chinese take out, but I will take this dish anywhere. I could eat this twice a day. I didn’t make any changes to the receipt this time except the options. The next time I will add more vegetables. All I can say Delicious. Made this last week…amazingly flavoured and very easy and quick to make. Would definitely make again, and would definitely recommend it. Wonderful, Nicole, thanks so much! I’m to excited to try this recipe! If I’m using regular brown sugar (not the Amazon linked brown sugar substitute) would you suggest light or dark? Thanks! Hi Kate, either work well, it’s purely personal preference. I just use whatever I happen to have on hand and that usually tends to be light brown sugar. I followed the recipe exactly, but doubled it. For me, I found this made too much sauce, and the sauce was too sweet. I will tweet again for next time. I made this for my sister and her husband last night for dinner. I cut back on the sugar and added a bunch more veggies. Per your suggestion, I also included a few tablespoons of your black bean sauce. The stir fry was phenomenal! My sisters husband called it a ‘restaurant quality dish’. My sister and I both have celiac disease, so finding your stir fry and sauce recipes have been life changing! Thank you so much for your amazing recipes! I’m so happy to hear that, Melissa, thank you! This was SO delicious! Also quick and easy, will be making this again, thank you! I made this for dinner tonight and it was fantastic, the whole family loved it!! I made this recipe today and it turned out perfect. The last recipe I used from another site was disgusting. This recipe turned out perfect. I will be making this often. Thank you for sharing. I’m so glad you enjoyed it, Julia, thank you! Excellent recipe!! I made it exactly as written and the whole family loved it, thank you! This was so good, made it for the family and everyone loved it. So awesome, Nathan, thank you! What could I use as a substitute for the Sherry? Hi, the closest substitutes are probably vermouth or madeira. It not, you can also use a dry white wine. A non-alcoholic substitute would be apple cider. Hi! I made this last night and the flavors were excellent. Just for reference, I follow the recipe and also added a TBS of store-bought black bean sauce. So delicious!!! Only one complaint by everyone who ate it…it was just a BIT too salty. I personally love lots of salt, but there was way too much here, even for me.Any way to cut out some of the salt out of this? Hi Kiran, I’m glad everyone enjoyed it, thank you! How salty it is will be directly related to the brand/type of soy sauce you use as well as the brand of black bean sauce. You can try a lighter soy sauce next time or simply reduce the amount. Outstanding! Made this exactly as written and it was perfection! Fantastic, Diane, thanks so much! 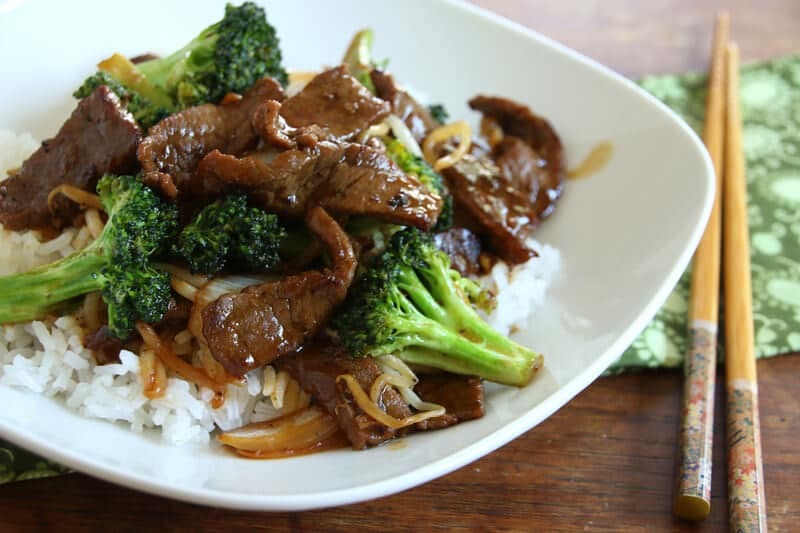 Omg, this broccoli beef is fantastic! I made it last night, followed the recipe pretty much to the letter… I actually used Skirt steak, adjusted for the 1.25 of meat I had… The one thing I would caution on is the Sesame Oil. Be careful with how much you use, I’d definitely err on the side of too little than too much – it is VERY overpowering. I’m so glad you enjoyed it, thank you! 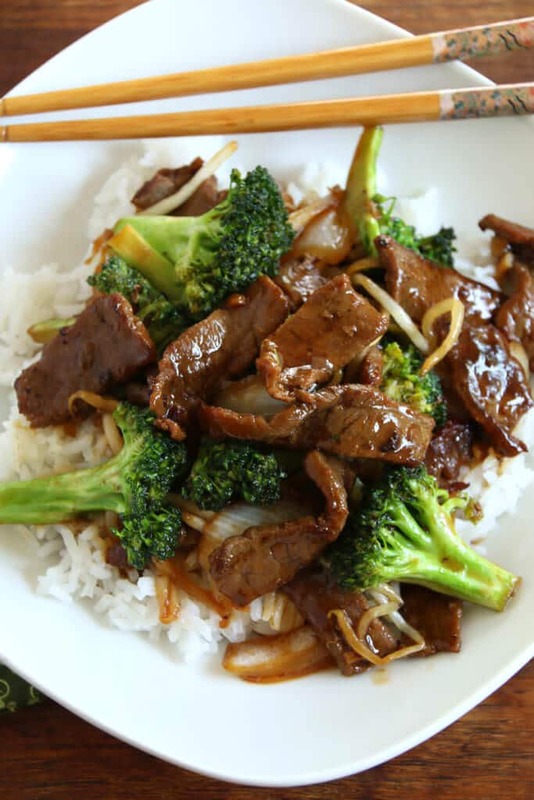 Appreciated the quick and easy, but the sauce was a bit too sweet – more like japanese teriyaki vs. the chinese style broccoli and beef we are accusomted to. I will definitely follow the rest of the recipe again as it was so quick and easy, and just make some adjustments to the sauce (less brown sugar) and maybe add some oyster sauce. Excellent recipe. Made this the other ight and it was fabulous. The sauce was fantastic! I’m thrilled to hear it, Brian, thank you! Second time making this in a week, THAT’S how good it is!! Thanks for sharing this awesome recipe! Awesome, Natalie, thanks so much! Great recipe – husband AND grandchildren loved it! Can’t get better than that! That’s fantastic, Mary, I’m so glad – thank you! 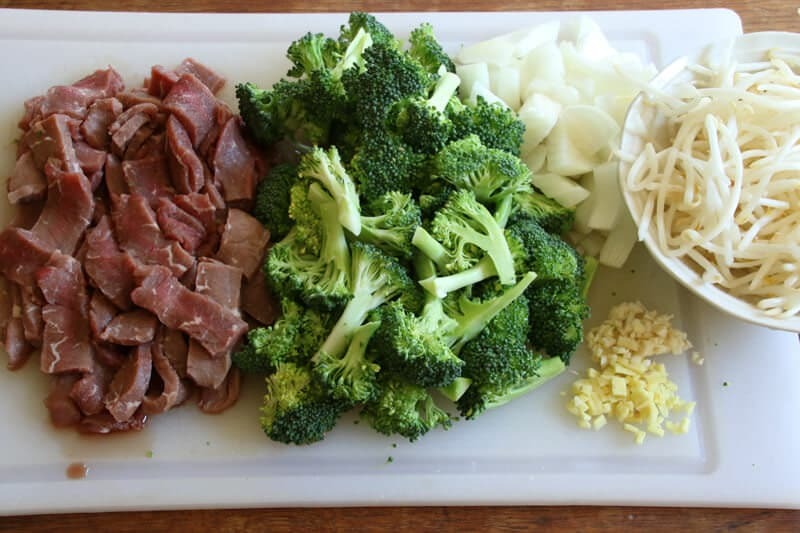 This is the best and most tasteful beef broccoli recipe i have found yet! I found some black bean sauce at the grocery store down the Asian food isle and it made a huge difference! The taste was out of this world! Making it again soon! I’m so happy to hear that, Nicole, thank you! 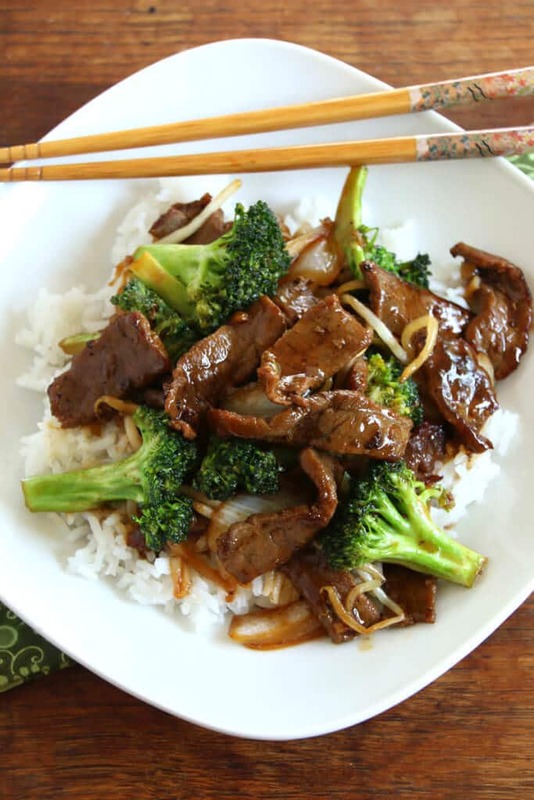 I love Asian foods, and yesterday I was craving some beef and broccoli. I found this recipe and thought I would try it. 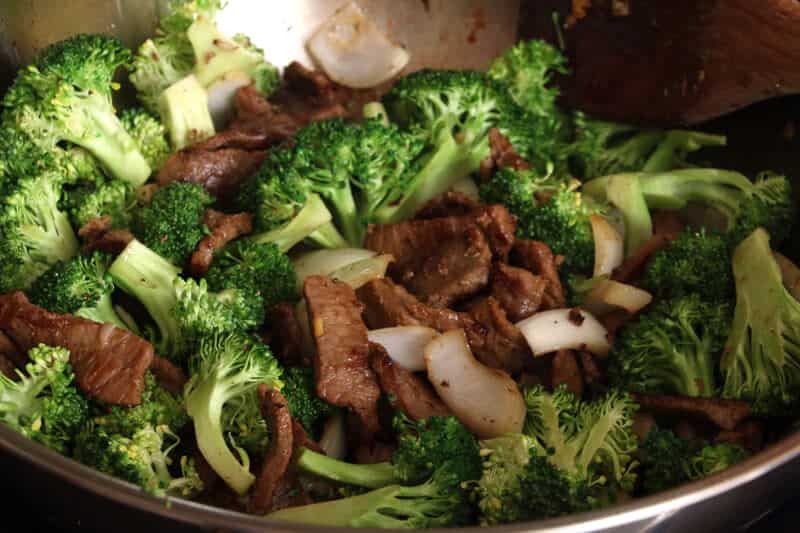 It turned out fabulous, one of the best tasting beef and broccoli recipes I have had the pleasure of devouring. Although, to my taste, it needed a little heat spicing, so to the sauce I added a little cayenne pepper, to my tasting. Magnificent… Next time, I’m thinking of adding a little hot Chinese mustard to the sauce. Comments…????????? Awesome, Rodney, I’m so glad you enjoyed it, thank you! Sure, whatever you like for increasing the heat, experiment away!